Mark Twain’s observations continue to ring true a century later. It is a land astoundingly rich in history, architecture, culture and traditions. The vibrant colours, smells, noises and unceasing activity overwhelm the senses. Viewed from a 21st C perspective, however, the contradictions and disparities in human conditions and material wealth are disheartening. Travelling by train and car through the countryside takes us back to our time in Africa more than 40 years ago, as we see women (primarily) carrying bundles of firewood on their heads and fetching water from communal wells. The poverty evidenced in the towns and cities is staggering. India’s GDP is now the third largest in the world, after the US and China. 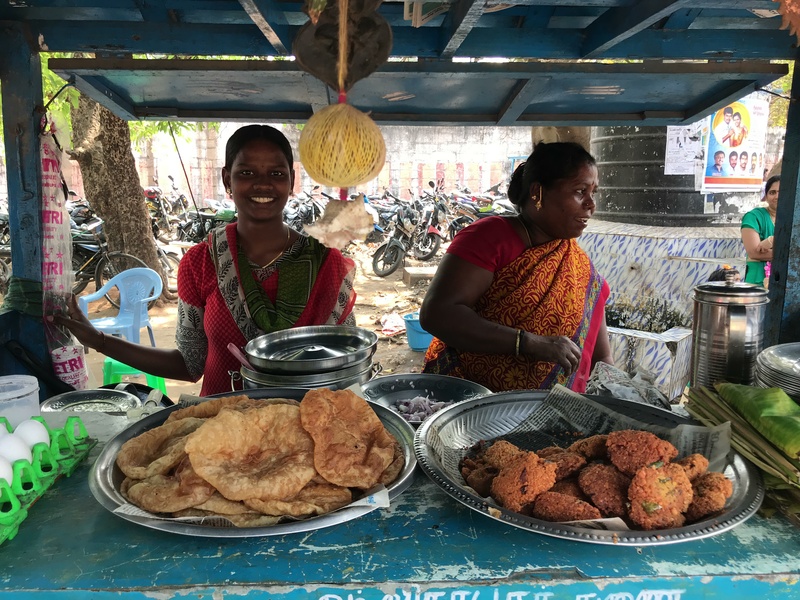 And yet, while the poverty rate in India (21% of the population in 2011) has been declining since the 1980’s, the number of people living in dire poverty, or on less than $1.25 a day continues to climb. By virtue of its population, India is home to 1/3 of the world’s extremely poor people. (UN MDG report 2014). Since 1991, the gap between rich and poor has continued to widen. A survey by Oxfam found that, in 2017, one Indian billionaire was created every two days, with India’s top 1% of the population now holding 73% of the wealth. As the Oxfam report suggests, “the growing divide undermines democracy and promotes corruption and cronyism“. People have spoken to us openly about the corruption endemic in India, something the Modi government has pledged to eliminate. In a recent survey by Transparency International (TI), an anti-corruption global civil society organization, India had the highest bribery rate among the 16 Asia Pacific countries surveyed. Nearly 7 in 10 people who accessed public services had paid a bribe. We were told that some who are clearly not in need pay to have their names included on a list to qualify for free housing and other assistance. 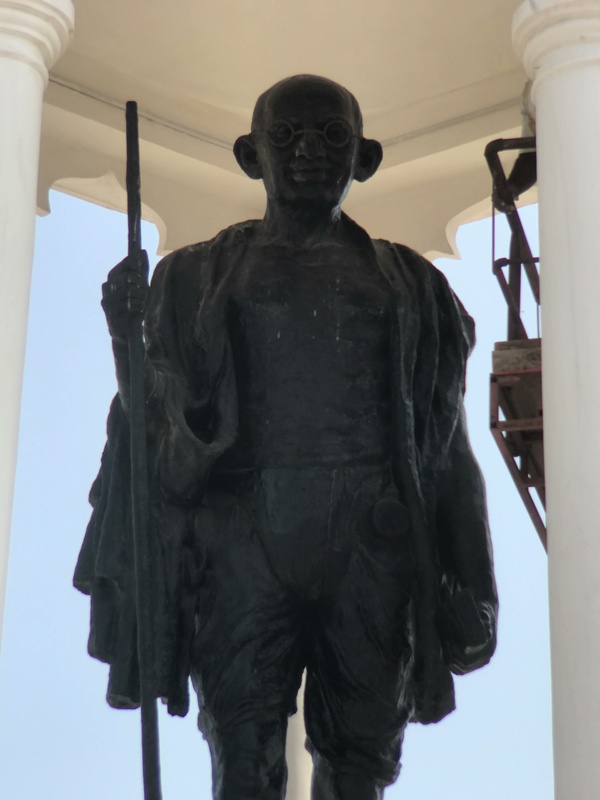 While people we spoke with were sceptical about Prime Minister Modi’s commitment to root out corruption, there is encouraging evidence of a growing anti-corruption movement in civil society. One tragic outcome of India’s failure to address these issues is an apparent dysfunctional public education system. 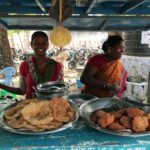 In her powerful book, The end of Karma: Hope and Fury among India’s Young, New York Times reporter Somini Sengupta describes a system where, despite investments in schools, improved teacher-student ratios and free lunch programs, the majority of students fail to reach what the curriculum expects. Approximately 25% of teachers don’t show up to teach on any given day and student attendance is around 71%. A 2011 study referred to by Sengupta revealed that 40% of children drop out between Class 5 and Class 9. Among those who made it to Class 10, another 40% dropped out within a year. 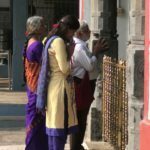 Despite its reputation as an IT powerhouse, fewer than 15% of college-aged Indians go to college. The challenges are enormous for a country whose population includes more than 300 million under the age of 15 and is expected to exceed that of China by 2022. We had read that, today, there are more people in the world with cell phones than toilets. That would certainly appear to be the case in India, where cellphones are everywhere, while 600 million people do not have access to a toilet. 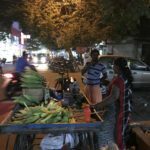 While we were there, the Hindu Times announced that the Greater Chennai Corporation declared the city ‘open defecation-free’. The Modi government has also launched a “Clean India” campaign. This week, the Lancet published an article on the issue, reviewing a Bollywood movie that highlights challenges to achieving such goals. Apparently, for a variety of reasons, including cultural and religious impediments (having a toilet in the confines of a house is considered to be impure), there is a fair amount of resistance to having toilets in homes. The prevalence of PD in India is lower than estimates for North America and Europe, although the reasons for this are not known. 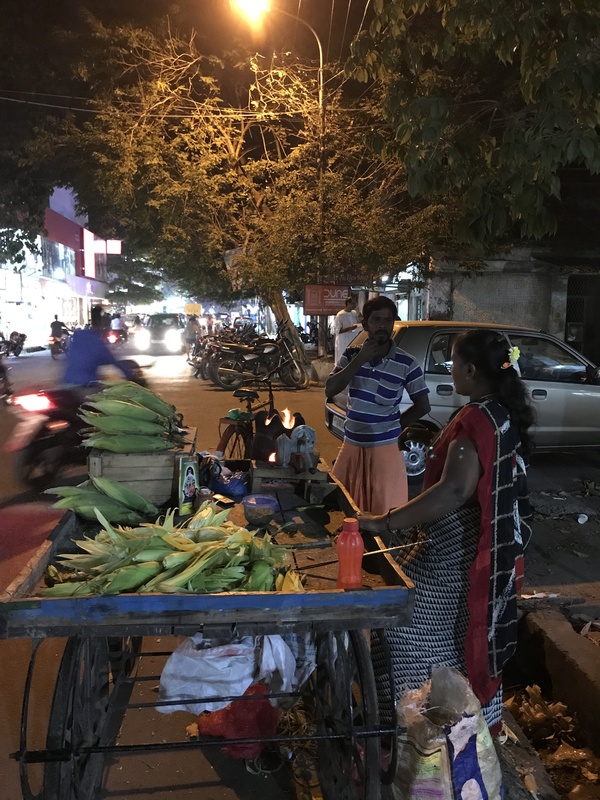 A door-to-door survey done in Bangalore district in South Karnataka in India in 2004, found a rate of Parkinsonism of 33 per 100,000 (crude prevalence). (compared with a number of 200 per 100,00 in Canada). Given the size of India’s population, the numbers of persons with the disease in the country is large, at approximately 450,000. 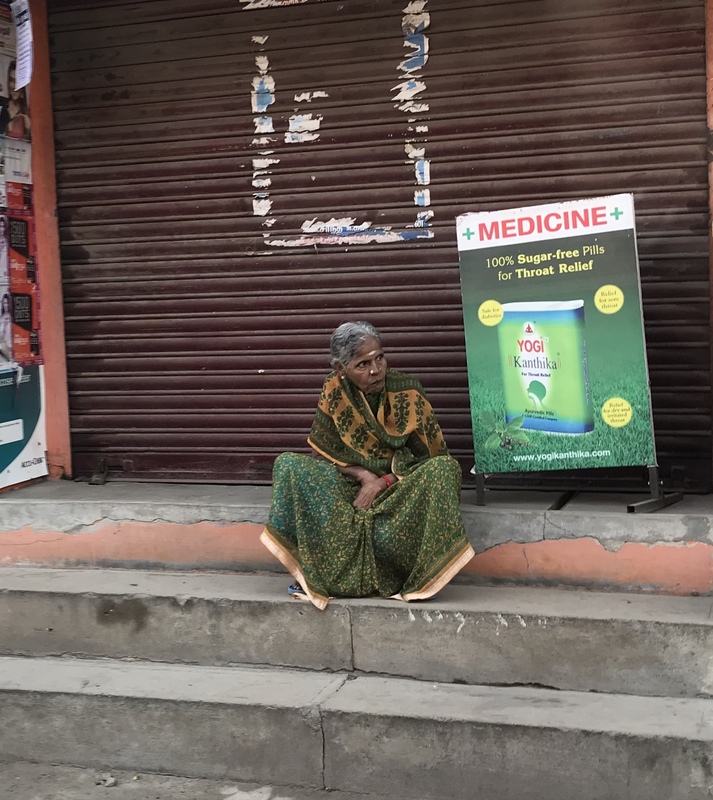 Diagnosis and treatment of PD in India is hindered by inadequate awareness of the disease, low numbers of medical professionals in the public system with specialized training in PD, poverty, and near total absence of health insurance or social security. 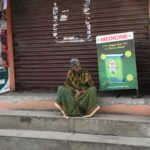 While drug costs in India are lower than in developed countries thanks to domestic pharmaceutical manufacture, drug treatment is still out of reach of many. The cost of medications generally can consume between 16-41.7% of an Indian patient’s income. Surgical treatment options for PD are even less accessible for patients of lower socioeconomic status. Many PD patients seek alternative medicine, Ayurveda being the common form available. 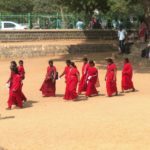 Sources: Review of research on PD in India. Ann Indian Acad Neurol. 2016 Jan-Mar; 19(1): 9–20. 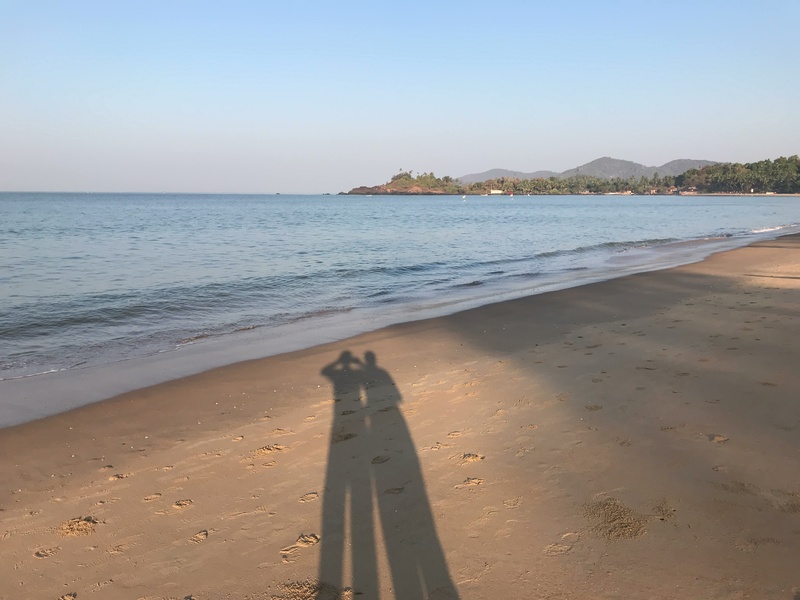 We were at a point in our India trip where we both felt a need for some down-time, preferably on the beach. Lois was still hoping to find a centre where she could learn some yoga and meditation techniques. 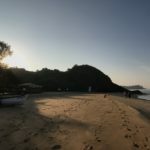 A search for yoga/beach retreats turned up a number of possibilities, although many were already booked up, especially in Kerala, our first choice. 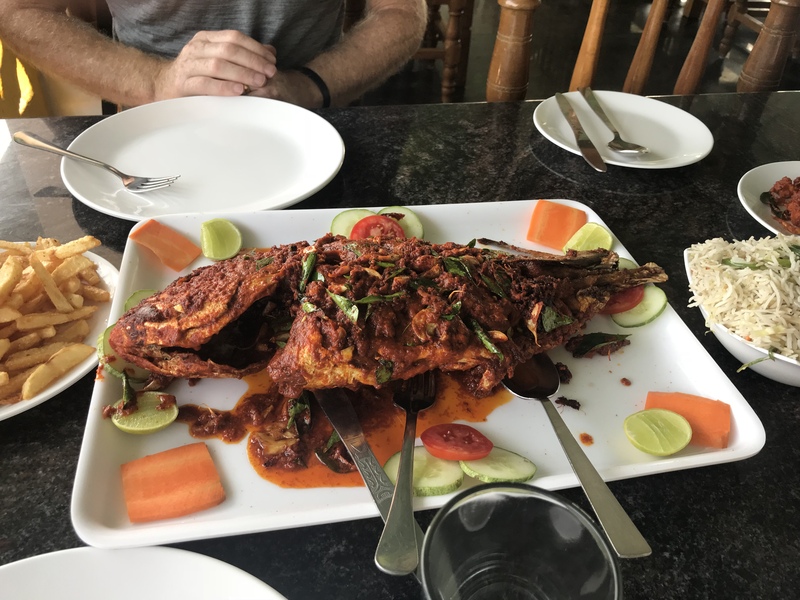 Finding one in south Goa, we reluctantly decided to forego a visit to Kerala (sorry, Caroline!) and fly to Goa. Taking trains across the country to Goa would have meant multiple changes and many, many hours of travelling. 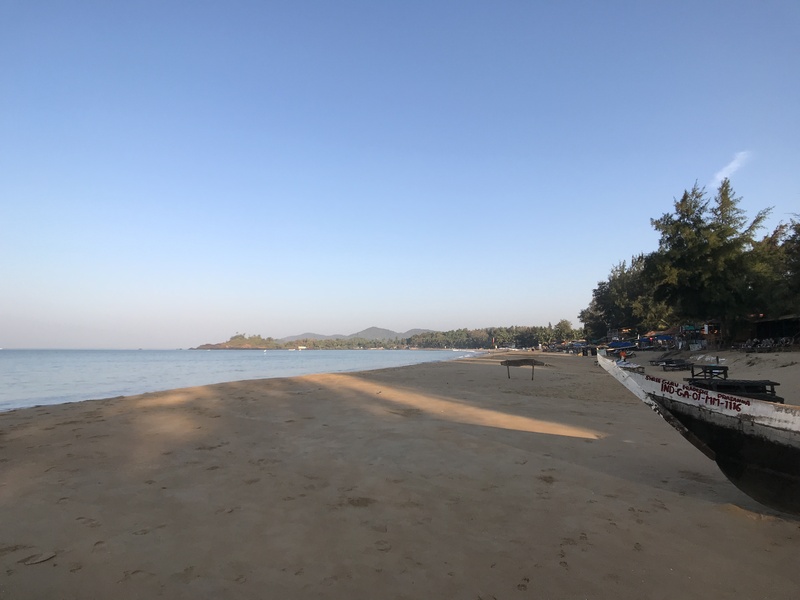 Even so, we still spent two hours at the end of the day in dense traffic before arriving at a wonderful white sandy beach and the Bamboo Yoga retreat. 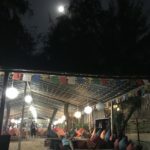 It was an idyllic spot on Pandem Beach, with wonderful food (and Sula wine). 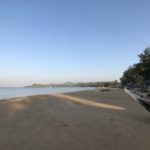 The accommodation was quite rustic though, being huts assembled each tourist season, with palm frond roofs and ensuite bathrooms open to the sky. 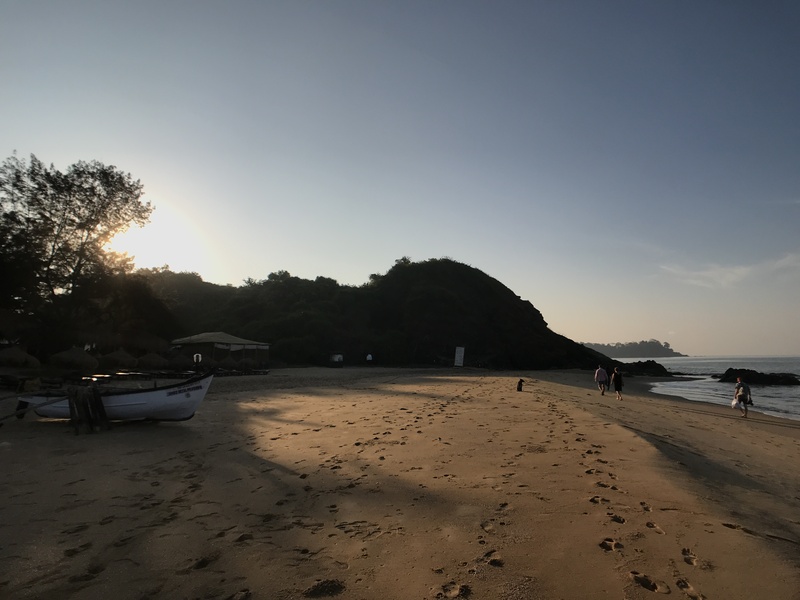 We normally wouldn’t have minded the rusticity, but the nighttime temperatures in January made for a chilly stay! Paul was unwell the first day and missed the yoga lessons, but appreciated the fresh coconut water recommended by the staff. This was refreshing and he feels is to be recommended in such circumstances! Lois participated in the classes which were more advanced than we had expected but a good introduction, nonetheless. The open studio overlooked the sea. 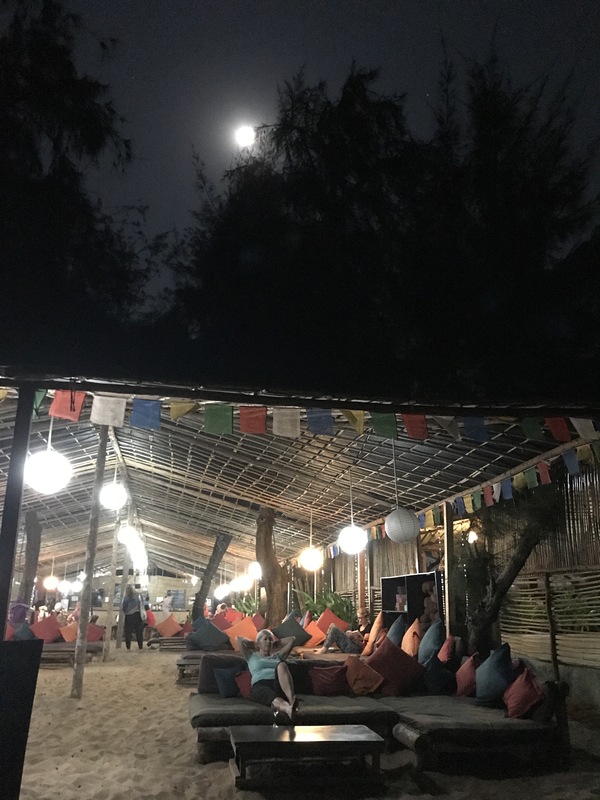 In the evening, the stars were brilliant and we were surprised to see the Super Blue Blood moon and lunar eclipse (we had heard about the super moon, but not the eclipse!). The moon was indeed red. 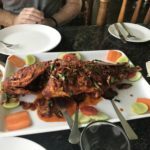 During the night of January 31st we learnt that Lois’ 97 year old mother had suddenly become ill. We left for Mumbai in the morning to return to Canada. Sadly, Lois’ mom passed away while we were waiting for our flight to Vancouver. On the platform at Vilapuram station, we were interested to see a table set up where a public health nurse was administering oral polio vaccine to children passing through the station. This is a reminder that Pakistan and Afghanistan, two of the three countries in the world which are endemic for polio are close to India. 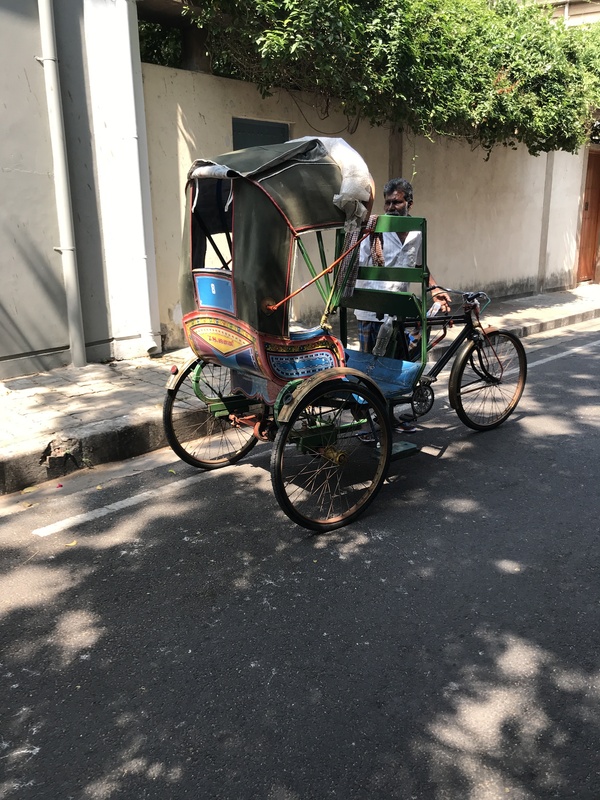 When the driver we had arranged to meet us to take us to Puducherry didn’t turn up, we discovered many phone calls later that the car had broken down. We were eventually picked up by the driver’s brother in an old car without working seatbelts. The 40 minute drive was fast, furious and quite terrifying. 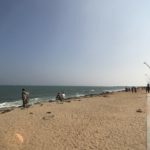 Puducherry (formerly Pondicherry) is known for its French colonial architecture and flavour (the area was under French rule until 1954), its seaside location and proximity to the interesting town of Auroville. 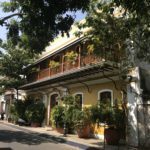 Our hotel was in a lovely heritage building in the Tamil section of town. A disused canal running north/south splits the town between the newer commercial section on the west and the leafy streets of the older French (White) Quarter towards the sea. 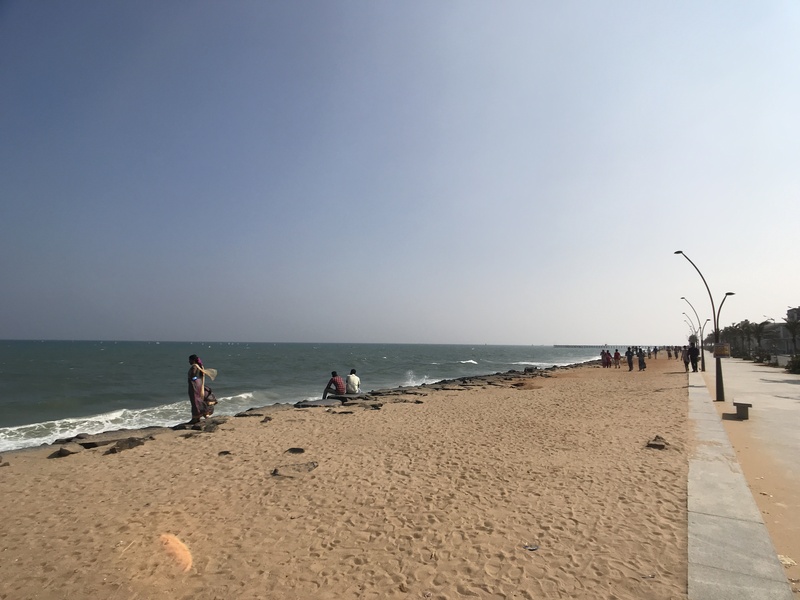 Except for the ubiquitous absence of continuous sidewalks, Puducherry is a pleasant city for strolling. Come dusk, when the scooters and auto-rickshaws came out in force, walking suddenly becomes a nerve-wracking experience! We wandered past houses that once would have been quite grand. Some, like the French Consulate, retain their character. 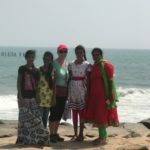 As we paused by the sea watching the waves break up over the rocks, we were approached by a couple our age who asked us to take their picture. 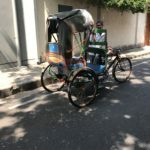 They were from Calgary and had been travelling on the “Palace on Wheels”, a luxury tourist train that runs in Rajasthan. 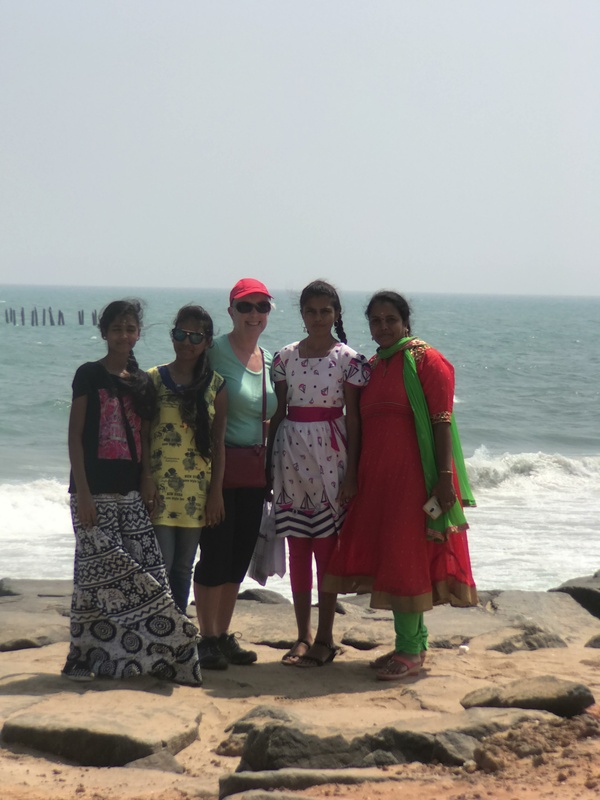 They were positive about the experience, apart from suffering a week of sleepless nights! 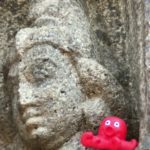 We visited and read about the Sri Aurobindo Ashram, a peaceful oasis and place of pilgrimage and study. It has an intriguing history, founded by Sri Aurobindo and a french-born woman, the “Mother”. Aurobindo’s teachings focus on ‘integral yoga’ that sees devotees work in the world, rather than retreat from it. We had hoped to also visit nearby Auroville, the « City of Dawn », founded in 1968 by ‘the Mother’, but no tours appeared to be available. Aurovillians run a wide variety of projects, from schools and IT to organic farming, renewable energy and handicrafts production, employing 4000 to 5000 local villagers. 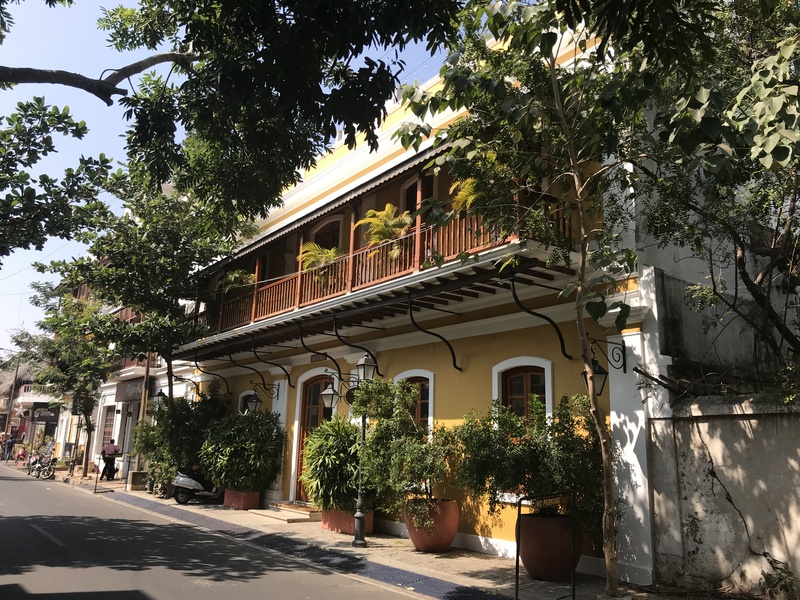 We took advantage of the French cuisine, sampling French crêpes at L’e Space, found delicious South Indian cuisine at Villa Shanti and decent espresso (7.5) at Cafe Coffee Day. January 24, 2018 – Day 73. Jan 25 – Jan 26. 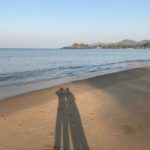 We left Bandhavgarh (Tala) by car for Jabalpur to catch a flight to Chennai, from where we intended to tour southern India by train. 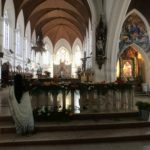 Although we were closer to Darjeeling, we decided it made sense to go south and then stop in Darjeeling on our way to Bangkok. 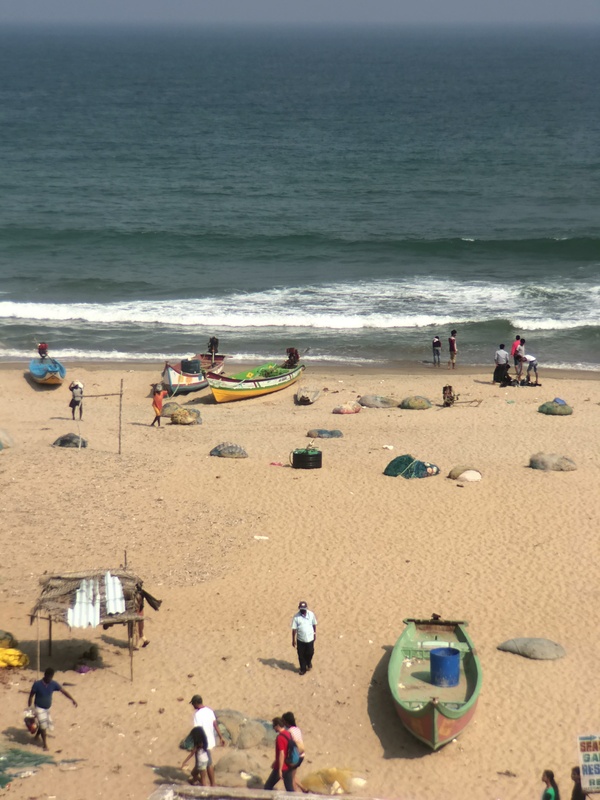 Chennai (previously Madras) is another huge city, with a population of 10M, but with a cleaner, more welcoming vibe to it than Mumbai or Delhi. 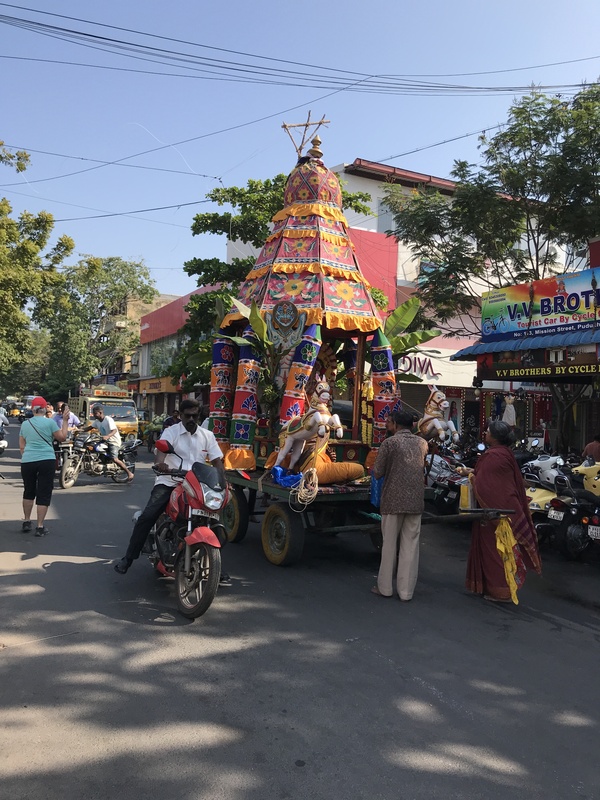 We had only intended to stay one night, but with difficulties finding accommodation further south during the busy tourist time of year, we decided to use Chennai as a base for a few days while we considered next steps. 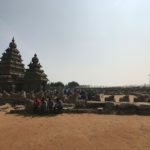 After spending a day laundering the entire contents of our packs and getting haircuts, we hired a driver to take us to Mahabalipuram, on the coast south of Chennai. 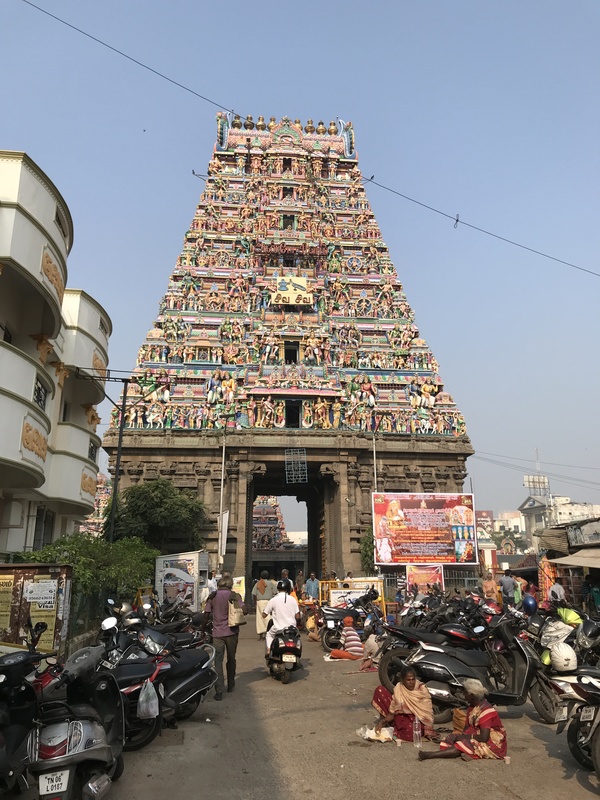 Before leaving the city, we stopped to visit the large and intricately adorned, rainbow colored 16th C Kapaleeshwarar Temple. 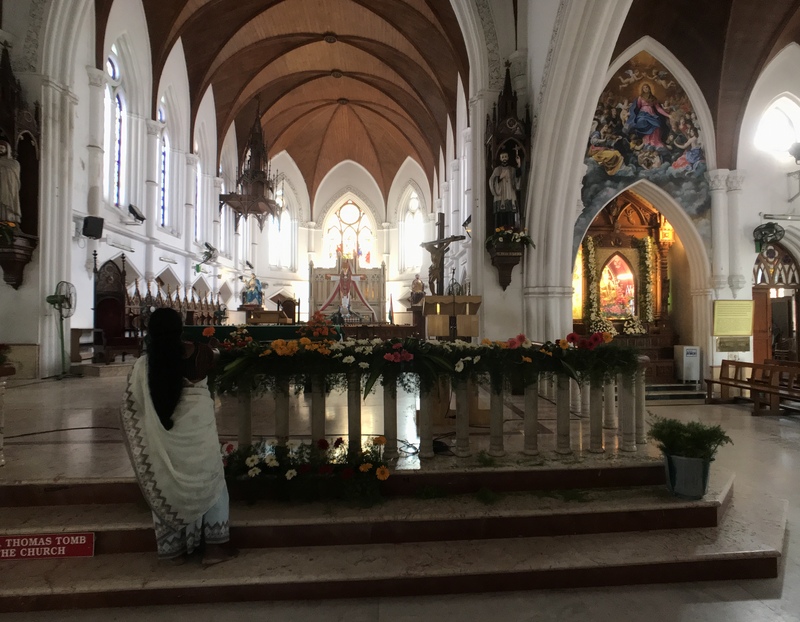 This contrasted with the 1896 neo-Gothic Roman Catholic Cathedral of San Thome in the southern neighbourhood of Mylapore. 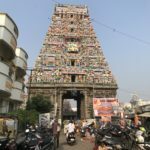 There is evidence that the ancient port city of Mylapore traded with Greek, Roman and Chinese merchants. St. Thomas the apostle arrived here in AD52 and was killed 20 years later for his attempts at conversions. 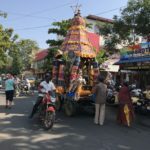 As it was the Republic Day long weekend, there were crowds of people in Mahabalipuram, families dressed in their finest, spirting India flags. 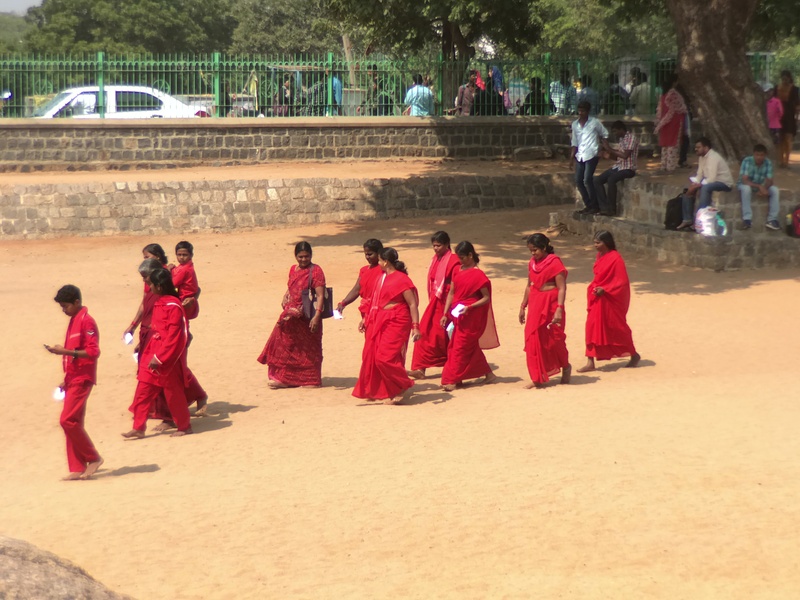 Many were dressed all in red, indicating they had made or were were making a pilgrimage to the nearby Mel Maruvathur Adiparasakthi Temple. 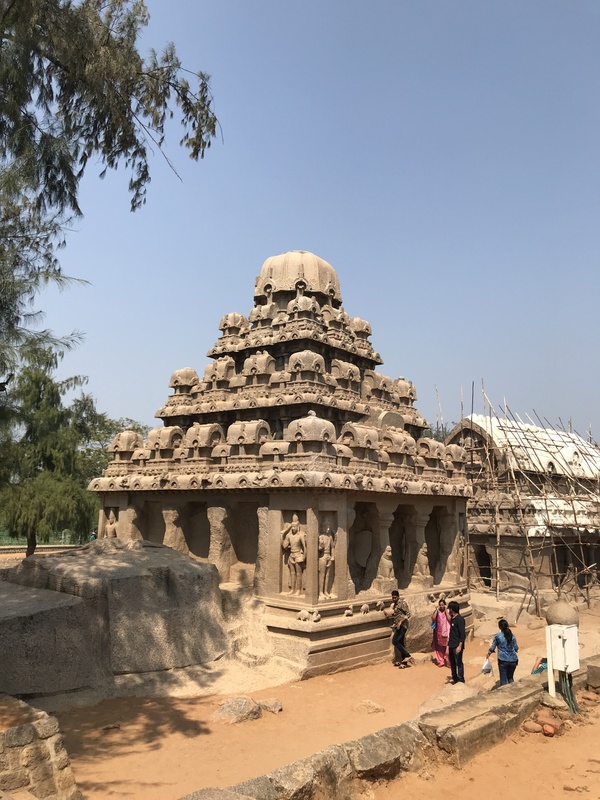 Mahabalipuram was the major seaport of the ancient Pallava dynasty. Built in the 7th C, the 400 monuments and temples of the town are UNESCO designated. 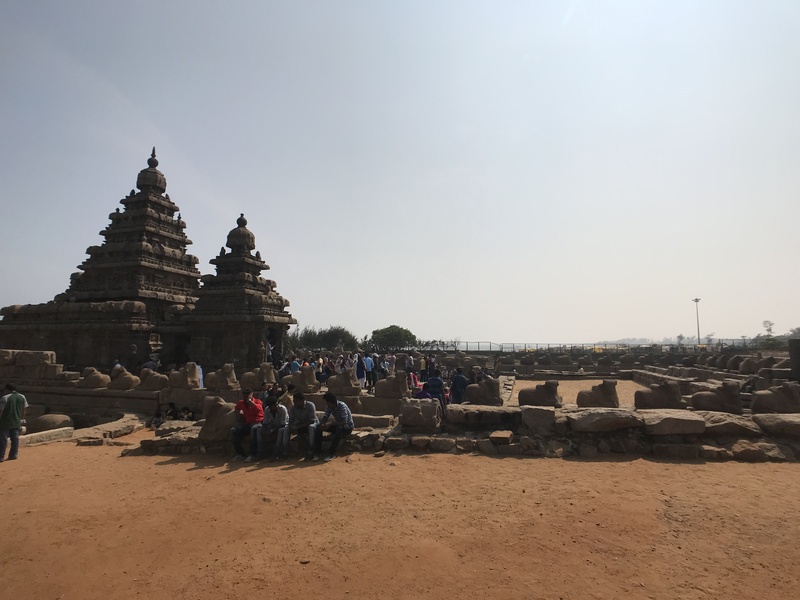 The group contains several categories of monuments: ratha temples with monolithic processional chariots, built between 630 and 668; mandapa viharas (cave temples) with ancient Hindu narratives and inscriptions in a number of Indian languages and scripts; rock reliefs, stone-cut temples built between 695 and 722, and archaeological excavations dated to the 6th century and earlier. 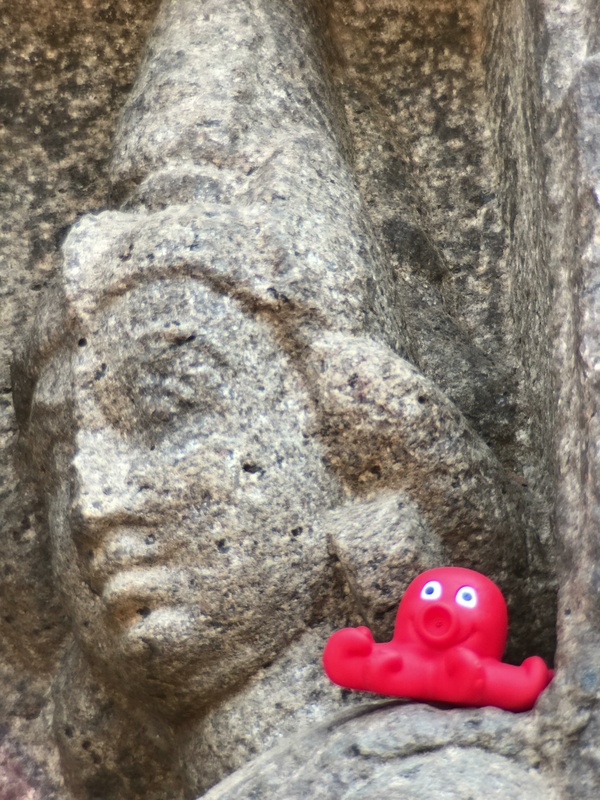 Almost all of them carved in situ from the granite bedrock, the temples and statues have survived remarkably intact. 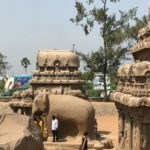 The Five Rathas, each carved from single large rocks, were buried in sand and uncovered 200 years ago. 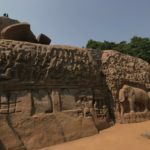 Other monuments are carved into the rock of Mahabalipuram Hill. 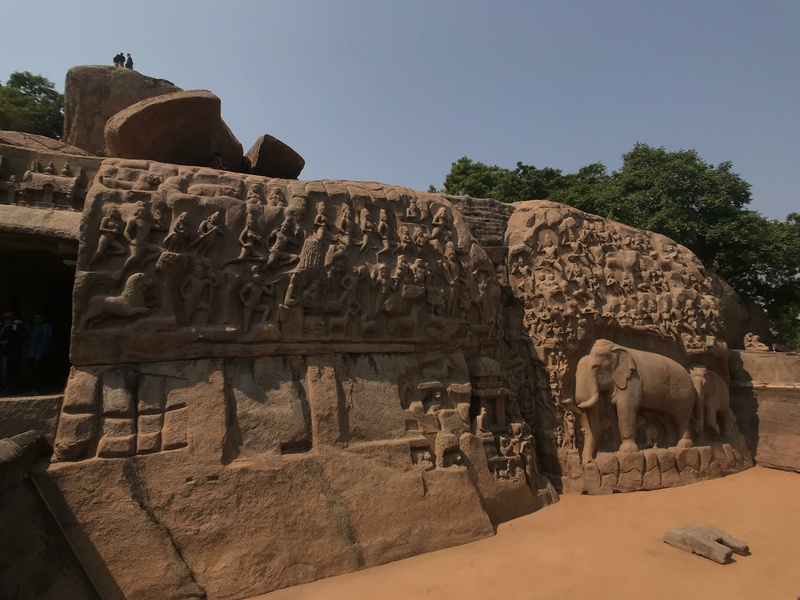 Arjuna’s Présence, a massive relief carving inscribed on two huge, adjacent boulders, contains scenes of Hindu mythology and everyday South Indian life. The Lonely Planet guide describes the scene “In the centre, nagas (snake beings ) descend a once water-filled cleft, representing the Ganges. 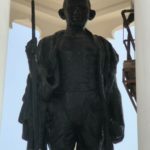 To the left Arjuna (hero of the Mahabharata) performs self-mortification (fasting on one leg), so that the four-armed Shiva will grant him his most powerful weapon, the god-slaying Pasupata. 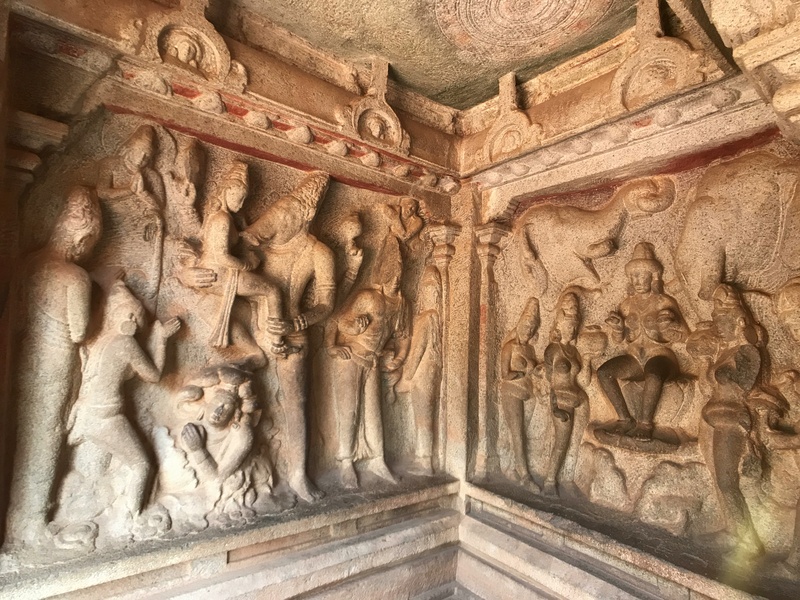 Some scholars believe the carving actually shows the sage Bagiratha, who did severe penance to obtain Shiva’s help in bringing the Ganges to earth. 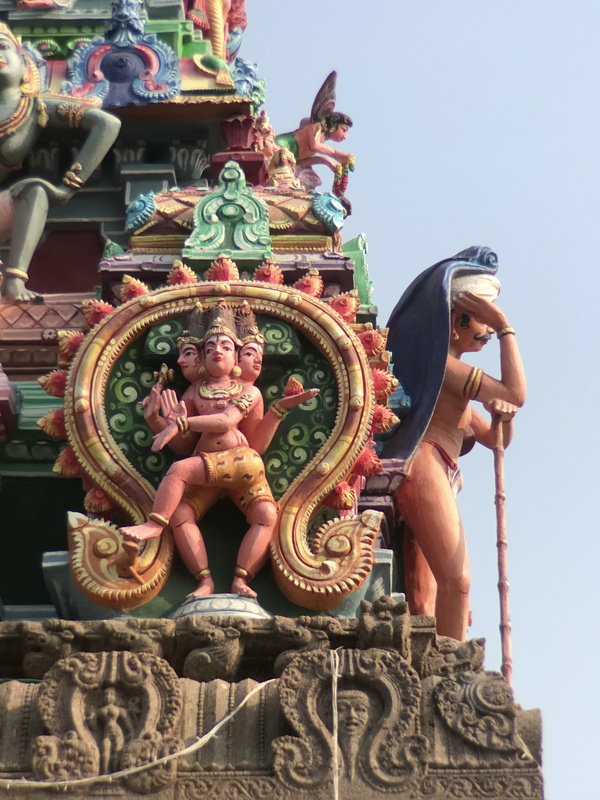 Shiva is attended by dwarves, and celestial beings fly across the carving’s upper sections. Below Arjuna/Bagiratha is a temple to Vishnu (mythical an- cestor of the Pallava kings), with sages, deer and a lion. 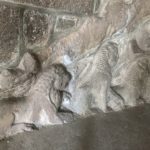 The many wonderfully carved animals include a herd of elephants and – humour amid the holy – a cat mimicking Arjuna’s penance to a crowd of mice”. 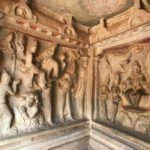 In the Krishna Mandapa is a carving of Krishna lifting Govardhana hill to protect the villagers and cows from a storm sent by Indra. 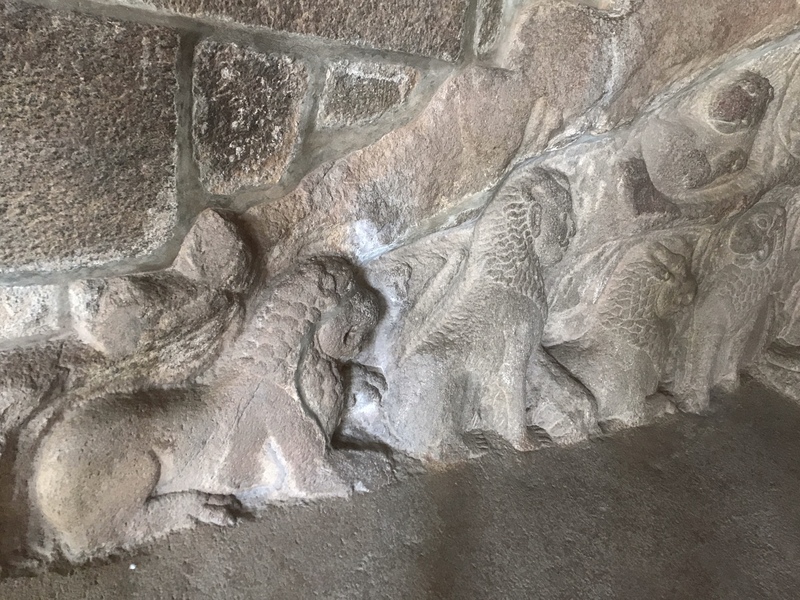 The temple contains an interesting series of animals carved in different styles including South Indian, Chinese, Greek and Roman. 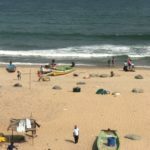 The only temple not carved into the rock is the remaining Shore Temple, three others having washed away. 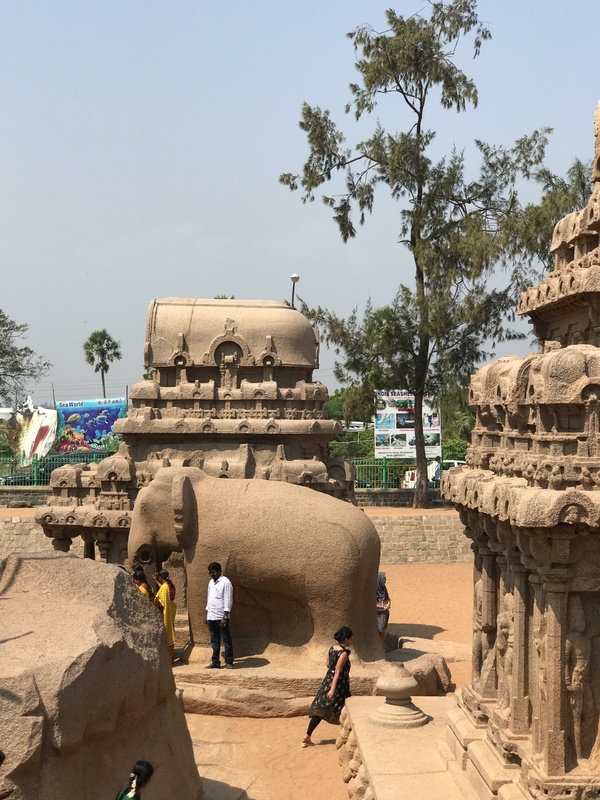 It is in a lovely position by the sea and notable for the many Nandi bull statues, Nandi being the carrier of Vishnu. 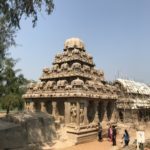 We read that the December 2004 tsunami briefly exposed large structures on the seabed about a kilometre offshore, which archaeologists speculate may be the ancient Mahabalipuram.